There are always familiar faces and familiar vehicles at the OPTIMA Ultimate Street Car Invitational, presented by KN Filters and in the case of Todd Rumpke's Corvette, both. Rumpke's Corvette took home top honors at the 2011 OUSCI, with Danny Popp behind the wheel and Todd himself is no stranger to the competition, having previously-competed in a Camaro back in 2012. Would that prior experience propel Rumpke's Corvette to the top of the standings? Even though he is no stranger to the OUSCI, Todd bucked the conventional strategy of having a dialed-in combination set before Las Vegas, opting for a last-minute swap out his intake manifold just prior to leaving OPTIMA Alley at SEMA for the beginning of the Detroit Speed Road Rally. He ended up having some issues, including a small fire, which fortunately, didn't cause him to lose any points, but did make for some interesting cruising. "We had to switch back and did this all in about 30 minutes," says Rumpke. "It was a bit of a thrash, but we got it done." Judging in the Lingenfelter Performance Engineering Challenge proved to be extremely tight and the Z06 ended up in a three-way tie for 61st place, although vehicles scoring between 17 and 18 points in that segment spanned all the way from 86th up to 37th place. When the OUSCI headed to the Las Vegas Motor Speedway for the track portion of the event, Rumpke was slotted to start on the RideTech Autocross. "I think that was tougher with having to run with the dust on the course and I ended up producing slower times than I expected," says Todd. Rumpke battled overheating issues, but still posted a top-20 finish in that segment (18th place) as one of 15 competitors to post 43.x-second times. The Corvette's overheating issues continued on the Wilwood Speed Stop Challenge, which complicated a course Todd already found challenging. "It was tough to get a good visual indicator, as everything just sorted of blended in," says Rumpke. Undaunted, Todd improved on his finish in the RideTech Autocross, posting a 14th-place finish in the Speed Stop, just .003 thousandths of a second behind Hartmut Feyhl's all-wheel drive Mercedes-Benz E63. The BFGoodrich Hot Lap Challenge has traditionally been Rumpke's strongest event and he certainly didn't disappoint with his 2014 performance. Of the 92 competitors still in competition at that point, Todd bested all but three of them, finishing fourth in that event. That performance helped propel Rumpke to a top-ten overall finishing position, all though ninth place fell short of Todd's goal of a top-five. With the benefit of hindsight, Todd, probably would've opted to not switch intakes just prior to the event and knows that impacted his overall performance in a very competitive field. "There are so many great cars in the field, as well as drivers behind them," says Rumpke. "I think the USCA and OUSCI will have to be careful how they set things up for the future, to keep things on a level playing field. Future competitors need to bring their best, because everyone just keeps getting better." Todd also wished live timing and scoring was more widely-shared and promoted during the event. "I think the OUSCI misses an opportunity to add some drama and excitement to the event, by having standings and timing more visible up to the minute," says Rumpke. 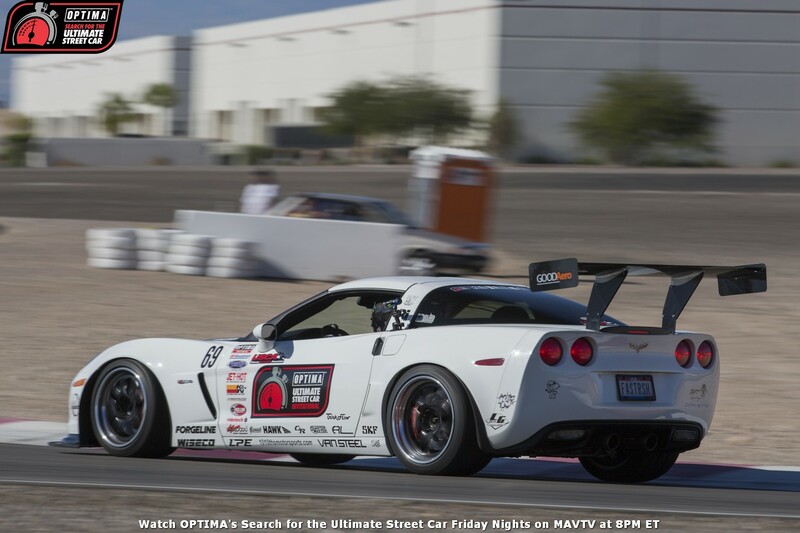 You won't want to miss out on the opportunity to participate in OPTIMA's 2015 Search for the Ultimate Street Car. The first qualifying event is less than 50 days away at Thunderhill Raceway. Registration opens Monday, January 19th (one week from today), so be sure to set your calendar now and be ready for the time of your life!